The job of the technician is higher in demand these days. Currently, more than 65% technicians are able to find related jobs from local firms through LinkedIn’s platform. What could more you ask by having this ideal opportunity? That’s why the experts always suggest professionals increase their network and land better jobs rather than relying on an ordinary chance. The review is written by our best LinkedIn profile writers and based on LinkedIn’s All-Star level of completion. A complete profile helps you be found by your future employers or clients. Your profile is currently missing several key completion elements. The profile picture and headline are the two most frequently viewed aspects of your profile. Since you have a specific title of wind turbine technician, consider updating your current headline to “Wind Turbine Technician Seeking Position” to help get the attention of your future employer. The beginning of your summary section should support your headline and further explain your experience and education related to your desired position. Consider adjusting this section to make sure that the most relevant information can found quickly. If you think that technician is an ordinary job that doesn’t require a professional page, you are living in dark then. Develop a profile indeed. Don’t write the unprofessional sentences. Filling up the fields is not necessary. Try to write two to three sentences that must sound professional. 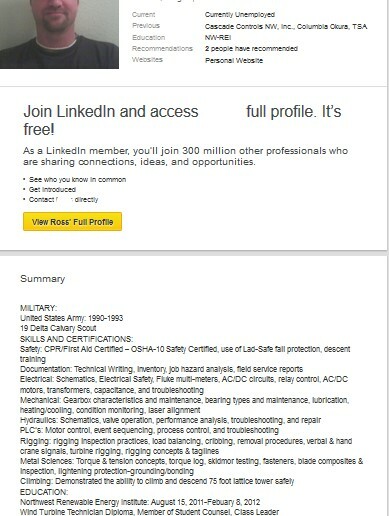 The grammar errors and spelling mistakes are not allowed to be made in the LinkedIn profile. Use the most professional picture on the profile. This is how you are able to attract employers in a proper way. The only best way to grab more attention of employers is to build more connections. The more connections you will make, the less able you would be to hunt for employment. The videos and blogs are always helpful in media section to impress the owners of different firms. Stop feeling shy and ask for recommendations and tips without any hesitation. The personal content should be published on the profile. If you haven’t started writing a blog, do it hurriedly. The most relevant content needs to be added to let others inform with the updated and recent info. The buzzwords create lots of problems as employers are not interested in reading everything good about you. Share the personal accomplishments instead. 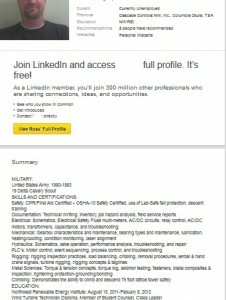 Contact our team today and receive the best technician LinkedIn profile review! “Move out of your comfort zone. You can only grow if you are willing to feel awkward and uncomfortable when you try something new”. This quote has been shared by anonymous. 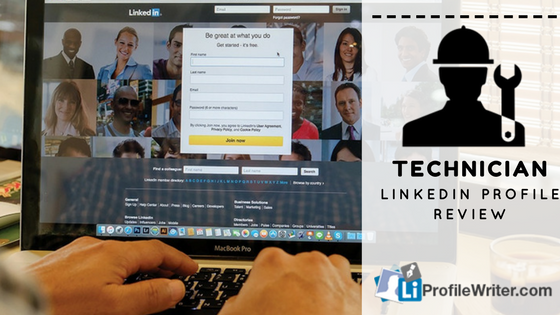 The actual purpose of sharing this saying is to is to let you know about the worth of making a LinkedIn profile. This platform is ideal to give you quintessential opportunities of work in related field. There are plenty of jobs available for the position of the technician. Therefore, grow your network and get the best yet suitable job with no hassle. If you read the content added in profile regularly, you are doing well indeed. Therefore, try to review the content before making it public. Let’s focus on checking the status. No one is interested in knowing about the current statuses regarding personal life on this platform. So, be professional. The headline plays important role indeed. Update it or rephrase the headlines written by any professional technician. You are not supposed to forget the summary’s section. Put all of your attention to this part for creating the valuable summary. Try to discuss the skills and professional achievements to impress the employers. In this way, you would be able to achieve your goal of securing a good job.